Roy Rogers, born Leonard Franklin Slye, is a legend in the film industry with over ninety starring roles. Now, you can join Roy, Dale, Gabby, and Trigger in this fully uncut and digitally-restored set. These DVDs will transport old and young alike back to the Old West with the "King of the Cowboys." 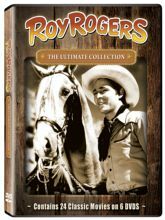 Watch with excitement as Roy thwarts smugglers at a mine in Mexico (in The Bells of San Angelo), saves a railroad right-of-way from a notorious conman (in Silver Spurs), attempts a daring rescue to save his horse Trigger from kidnappers (in Under California Stars), and much more.